Yesterday marked the 35th anniversary of the falling asleep of Fr. Alexander Schmemann. I would like to follow up on this occasion with some poignant thoughts from one of his lesser-known works, The Liturgy of Death, a compilation of four talks Schmemann gave in 1979 at a summer institute at SVOTS. 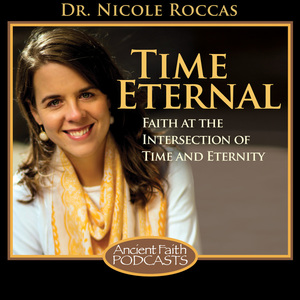 In these talks, Schmemann traced the historical development of Orthodox funeral rites and the challenges modern culture (and modern Orthodoxy) pose for a meaningful Christian response to death. The book formed a vital supplement to other readings in the course I helped teach this past semester on Death in Orthodox Tradition (at the Orthodox School of Theology in Toronto). In its mundanity, June 28, 1979–a date whose particularities no one is likely to remember (I wasn’t even born yet)–is a proxy for any ordinary day in our lives. We could easily ask ourselves the same question of today, or yesterday, or any other uneventful day of our lives. And behind our respective answers to this question lie vast worlds of meaning. If we regard today–and consequently every day, every moment–as an “irreplaceable” stepping stone on the path to the Kingdom, then all things take on meaning, significance, opportunity. It is telling, to me at least, that Schmemann’s reflection is part of his response to what he perceives to be a loss of Christian eschatology (on the part of both Church and society). In Schmemann’s lecture, eschatology could be candidly defined as the understanding that the “Kingdom of heaven is at hand”–that God’s will and purpose for this world are imminent rather than distant, real rather than doubtful, meaningful rather than meaningless. As a result of this belief, we come to understand that creation culminates and is culminating in the End, “when God will be all things, ‘all in all.’ … Ultimately, the glory of God . . . will triumph, and the world will become truly the temple of God and of eternal life” (Schmemann, 173-4). To begin to see this Kingdom-centered orientation of creation as the basis of all reality indelibly changes our perception of existence. The flattened worldview of secular consumerism (itself the byproduct of the Church’s neglect of the eschatological vision) recedes, the love of God and the beauty of repentance comes into sharper focus. “That,” Schmemann explained, “was the faith, why the martyrs died happy” (174). 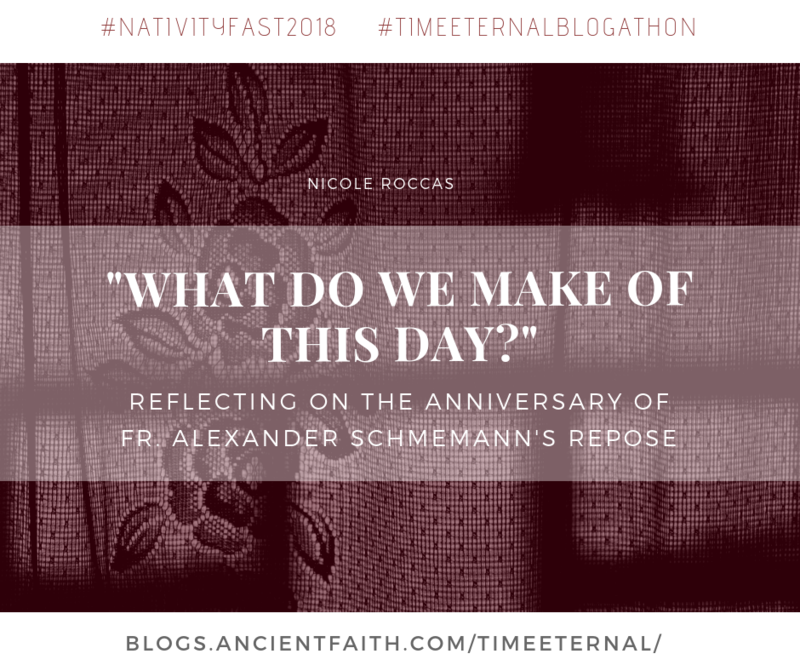 For Schmemann, the “liturgy of death” is not about the dead so much as it’s about proclaiming life, or what life is supposed to be, in Christ. It is easy to read theologians on the level of abstraction–to surmise their thoughts and explanations as wise but disconnected sound-bites. We forget, often, that these are real people, situated in their own place in time, historically and personally. They, like us, were breathing creatures who ostensibly said what they had to say because it truly mattered to them, and because they themselves were just human beings trying to learn to live (and die) for Christ. As a result, I think, it is easy to dismiss much of theology. Of course we don’t intend to dismiss it, but we allow it to reside only in our intellectual faculties rather than our experiential awareness. “Those are nice words,” we think to ourselves, neglecting to incorporate them into the lived, flesh-and-blood, moment-by-moment fabric of existence. What will we make of this day, December 14, 2018? And what will come of the time we have left on this earth? May we begin to recognize this day, and every day, as irreplaceable; and may our lives never cease to acquire their meaning from the Kingdom of Heaven. One of the books I am currently reading (slowly)through isThomas Hopko’s Winter Pascha. He shares an account of Father Schmemman’s last days and funeral. As you say, the particularity brings it out of the abstract/intellectual into lived reality. At the same time, it becomes almost iconic, with the storm on the afternoon he died, and the bright sun —in a cloudless sky— on the day of his funeral. Many people have been given a life expectancy, based on a medical diagnosis. If you are of a certain age, especially, you meet them, know them. I do wonder how one helps them move toward the perspective you share here, if they are open to it, and have not done that hard work beforehand. This is not an academic question. They may be nominally Christian. Maybe this resembles the book you are writing, a translation of sorts. Not sure what book you are referring to that I’m writing. In any case, yes I’ve also read the passages in Winter Pascha you refer to. Have you read Fr. A’s Journal? It is full of observations like that and I suspect this rubbed off on Fr. Hopko, or he was trying to honor Fr. A’s vision of reality in writing these observations down. Poiniamt thoughts. Trying to embrace every, every moment as irreplaceable. Hi Andrew, unfortunately Schmemann does not really elaborate on that point–at least not in this passage. I consolidated the quotation a bit, so Fr. Andrew sort of digresses where the ellipsis is (…) but the part I took out does not answer your question. If I could be permitted to fill in the gap, I think there are two things at work here. The first is that any sin–any turn from God–is a tragedy. Not because God is so vengeful He cannot forgive us, but because it is tragic to think of a break in communion with Christ. We are always and should always regard ourselves as the “chief among sinners” (1 Tim 1:15). The second/related sentiment here is akin to St. Sisoes famous words on his deathbed: “I have not begun to repent.” Repentance is essentially bottomless, infinite; no matter how much we begin to enter into this manner of being, we still have infinity to go. Likewise, God’s love is equally bottomless and inexhaustible. Our relationship with Him is one that is always meant to be forward moving, and in a sense it is as though each moment of repentance is the first. That is what I think lies behind Schmemann’s statement. It was not some kind of scandalous confession, but rather a statement about the nature of repentance and the love of God.